Herpes zoster, also known as zoster or shingles, is a painful skin rash caused by the varicella zoster virus (VZV) – the same virus that causes chickenpox. After a person recovers from chickenpox, the virus stays dormant (inactive) in the body. For reasons that are not fully known, the virus may reactivate years later, causing shingles. Almost 1 out of every 3 people in the U.S. will develop shingles in their lifetime. In the U.S., currently an estimated 1 million people get shingles every year. Although children can get shingles, the risk increases with aging. About half of all cases occur in adults aged 60 years and older. The blisters typically scab over in 7 to 10 days and clear up within 2 to 4 weeks. For some people, the pain (PHN) can last for months or even years after the rash goes away. Shingles cannot be spread from one person to another. However, the virus that causes shingles (VZV) can spread from a person with active shingles to another person who has never had chickenpox. In such cases, the person exposed to VZV may develop chickenpox, not shingles. The virus is spread through direct contact with fluid from the rash blisters caused by shingles. 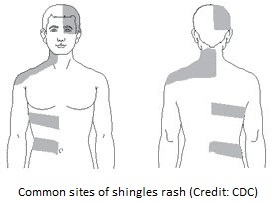 A person with shingles is not infectious before the blisters appear. Once the rash has developed crusts, the person is no longer contagious. Shingles is diagnosed by a combination of symptoms, physical signs, and occasionally, laboratory tests. People with symptoms of shingles or persons who have not had chickenpox who have been exposed to someone with shingles should contact a healthcare provider immediately. Several antiviral medications are available to treat shingles. These medicines will help shorten the length and severity of the illness. To be effective, they must be started as soon as possible after the rash appears. People who have or think they might have shingles should call their healthcare provider as soon as possible to discuss treatment options. Pain medications may help relieve the discomfort caused by shingles. Wet compresses, calamine lotion, and colloidal oatmeal baths may help relieve some of the itching. Anyone who has recovered from chickenpox may develop shingles. Because health care providers are not required to report shingles to the Department of Health, the number of cases occurring annually in Hawaii is unknown. Shingles vaccination is the only way to protect against shingles and PHN. Are not sure if they had chickenpox. There is no maximum age for getting shingles vaccine. Varicella vaccine may prevent or lessen the severity of illness if given within 3 days and possibly up to 5 days after exposure in healthy persons aged 12 months or older. Persons at increased risk for severe disease and complications are recommended to receive VariZIG (a blood product containing antibodies to the varicella virus) as soon as possible and within 10 days of exposure.